At the end of the era known as the Pliocene a period of major climatic fluctuations began and that period is still going on. In a few thousand years, there will be a new ice age. We can determine ice ages further back through analysis of Antarctic ice. The ice encloses a little of the air in small bubbles. Also in sediment layers we find plankton shells from plankton species that are sensitive to temperature. How much there is of a given species depends on the water temperature and the water temperature is dependent on the solar radiation and the solar radiation is what ultimately controls the climate. Luckily we live in a warm period between cold spells. The last warm period is called the Holocene. This warm period had its optimum at least in the northern hemisphere during our Stone Age. All our glaciers melted and even the great Icelandic glaciers. The warming after Ice Age maximum came quickly and it was warmer over the world even if it was warmest in the northern hemisphere. During this time period also the Sahara was green, but nothing lasts forever as you know. The temperature went down and the glaciers began to re-form in different places, this is called neoglaciationen. Why did the climate began to swing more in the late Pliocene and continued to swing throughout the Pleistocene? See picture for fluctuations between glacial and interglacial below. It has also been fluctuations in temperature during this interglacial. 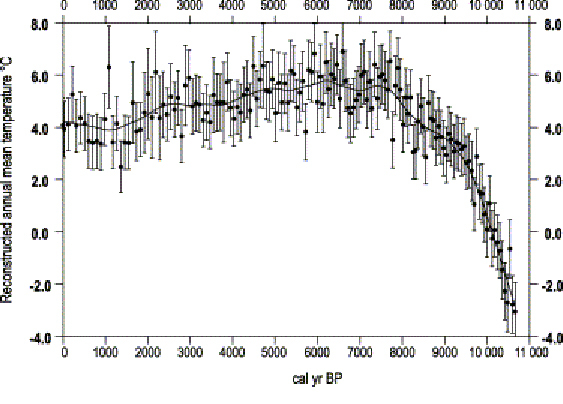 The Stone Age was not hot all the time if we are to believe the proxy curve from Greenland south, GISP2. Even in the curve from southern Finland based on pollen studies appear swing in temperature but not as much as the Greenland curve. This pollen diagram is from the woodlands in southern Finland. Back to the question of what caused so large swings in climate? As anyone might imagine, it depends crucially on the sun, but it's hard to answer this question. 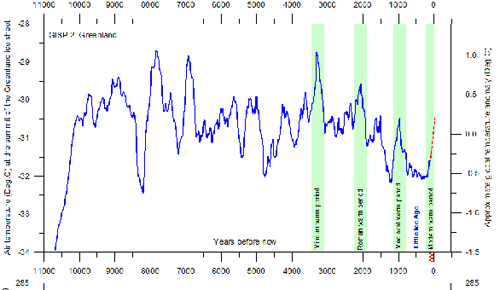 The major ice ages during the Pleistocene are explained by Milankovitch Cyclerna which allowed the solar radiation during certain seasons to decline. http://sv.wikipedia.org/wiki/Milankovi%C4%87-cykler It has to do with the Earth's orbit around the sun and how elliptical it is and how the Earth's axis tilt is.